The Mississippi River will soon have a new paddlewheeler offering river cruisers a trip through America’s heartland, starting July 3, 2017. The 166-guest American Duchess is the first purpose-built paddlewheeler, operated by the American Queen Steamboat Company. The American Duchess will join the American Queen and the American Empress in the Memphis-based American Queen Steamboat Company. New itineraries offered on the American Duchess include overnight stays in the heart of Nashville as well as shorter roundtrip itineraries from the “Music City” and New Orleans. For added convenience, guests can also enjoy departures from Chicago (Ottawa, Il.) – a first in the company’s history. 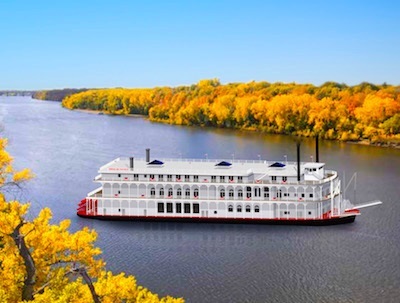 “The American Queen Steamboat Company has led the way in a rebirth of U.S. river cruising as thousands discover our heartland and the Pacific Northwest, served by an award-winning, All-American crew,” Sykes said. The American Duchess will feature the largest suites on the river in every category. The American Duchess will offer a generous space ratio showcased by three 550-square-foot Owner’s Suites, four 550-square-foot Loft Suites – a U.S. riverboat first – as well as spacious Veranda Suites and Interior Suites. Featuring open seating with two dining venues, The Grand Dining Room and The Grill Room will offer regionally inspired cuisine similar to that of the American Queen. “In five short years, the American Queen Steamboat Company has grown to over 500 employees and we look forward to hiring about 100 more, right here in the U.S., in anticipation of the American Duchess inaugural season,” shares John Waggoner, the line’s chairman as well as president and CEO of HMS Global Maritime, operator of over 85 U.S.-flagged vessels.